Ben and I are holding a bicycle photo contest! We want to see pictures of you and your bike. Take a picture while riding or of your bike hanging in the garage or something really silly. Your picture will be posted to our bike picture gallery. Ben and I will choose one winner on the first of January 2011, and maybe some honorable mentions, too. 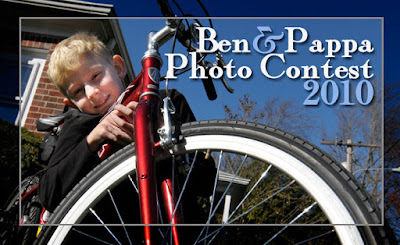 We will post the winner on the Ben and Pappa blog, but wait that not all, we are planning to give the winner a prize. Right now we have not figured out just what that will be but it will be a very cool prize indeed - maybe some cool piece of art made by Ben and Pappa or something you really need for your bike...whatever we decide - you could be the winner. Maybe one of our model ships. . .